Have you been out to the car lot recently? New cars now have new mileage statistics stickers. Well perhaps not all cars but the Electric Vehicles and Hybrid Vehicles show a lot more data about auto performance and how it affects the environment than in the past. 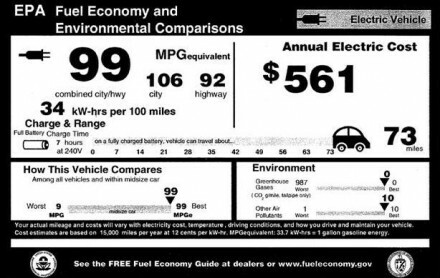 Of course cars sold in California offer smog and environmental impact data as well. If you study the above sticker closely, you'll see that this EV has a gas equivalent of 99 miles per gallon. Pretty impressive.